It is dusk on May 14, 2016. And it is the eve of my departure from Borno state, after more than a week of unearthing some untold stories about Nigeria’s war against insurgency and the abominable treatment of the soldiers prosecuting it. My guide and I run into a man who has been housing “close to 50″ Internally Displaced Persons (IDPs) in his small compound. It looks too good to be true but I ask to be immediately taken to this house — located at Shagari Low-cost B — right in that darkness. “All of us are from the same village,” the elderly man says as we reach his house and I embark on a furtive head count of the IDPs sprawled across the mats at the entrance. I count more than 30, and I am told they are 49 in all. The rest are at a nearby mosque, observing the Salat al-`Isha (early night prayer) of Muslims. Their host is Abba Kyari — but he is not the chief of staff to President Muhammadu Buhari. In any case, the known Kyari will struggle to match the nobility of the deeds of his unknown counterpart. “As far as I am concerned, we are all one family,” Kyari adds. 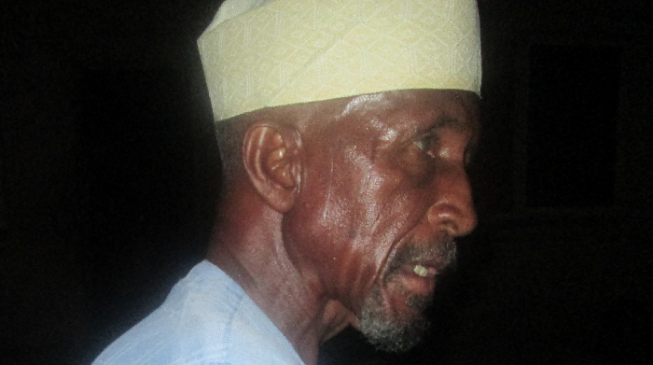 The septuagenarian was living with his wife until sometime in mid-2014 when Boko Haram attacked Kaga local government, between Benishek and Galangi, killing scores of people and razing their houses. Some of those who managed to escape were the 49 Kyari currently houses. Although it is a choice he does not regret, it is also one putting a strain on his meagre pension. “As we’re sitting down here, I can confirm to you that my pension is N50,000. And just yesterday, I withdrew it all so I could feed the 49 of them,” he says. Kyari is alone in his care for the 49 IDPs, knowing that it is not enough to offer them a resting place at night, and then watch them starve in the day. 1.9million people are internally displaced by the insurgency in the north-east. The consequence is that government itself has a tumultuous time fending for their needs, and people like Kyari hardly get a look-in from government or the National Emergency Management Agency (NEMA) and their local and international partners. “I know that government is doing a lot because of the sheer number of people in IDP camps,” Kyari admits. Kyari has another worry: “In Shagari Low-cost Estate alone, there are more than 3,000 displaced children who are not even schooling. I keep asking myself: what will be the fate of these children? “We say children are the leaders of tomorrow, yet they are not schooling. They are idle; they are not doing anything. They have just been abandoned here. If you had come yesterday, you would have seen more than 40 of them begging street by street. Kyari wants the government to take displaced persons as one, whether they’re inside the IDP camps or outside. “I want government to see to how these people eat,” he says. “Two, abandoning kids here, without schooling, leaves their lives damaged. “Three, these people need water to drink. I spend N200 daily just on the water they drink. In Shagari Low-cost A and B alone, the population is about 500,000 yet there is acute shortage of water. Even the housing is inadequate.